Nancy Pelosi didn’t think many people were paying attention when she slipped into Austin, Texas a few days ago. The Speaker of the House was caught in an impromptu press conference where she said immigrants have a right to vote. The 78-year-old Democrat made it crystal clear that all “newcomers” from the Southern border should not have their votes suppressed in all upcoming elections. That’s when Nancy immediately got destroyed. Don’t miss this. Nancy Pelosi was setting the tone for the upcoming battle over voter’s rights. It’s been a long time coming that the Speaker, and her cohorts, have been getting ready to introduce illegal aliens as the “newcomers” who should have a right to vote. If you’re shocked, don’t be. This goes along with the number one reason the left is for open borders. It’s also the reason they oppose ICE agents and the Border Patrol. Ever since the Democrats lost their way and became the party of identity politics and socialism, instead of the party of the blue-collar workers, and middle-class values, they started to see a bad trend. They no longer appealed to white middle-class Christians, and they no longer got new voters. Not in the numbers needed to keep up with the GOP. So, that’s when they changed from supporting strong borders to doing a 180 and becoming the party who calls walls “immoral.” Unless they can get illegal aliens voting, they don’t stand a chance. “And these newcomers make America more American. And we want them, when they come here, to be fully part of our system. And that means not suppressing the vote of our newcomers to America,” Pelosi added. What “newcomers” to America is Nancy Pelosi referring to? 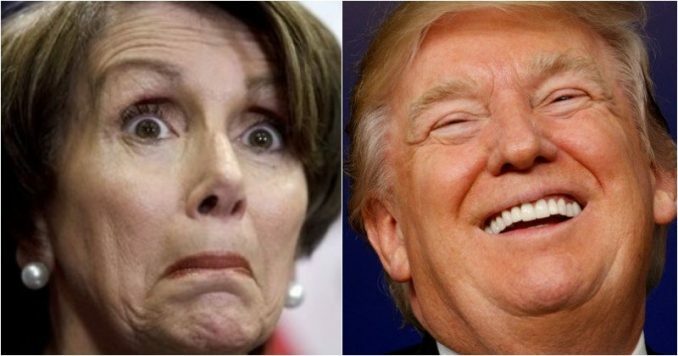 The “newcomers” who should be fully able to participate in voting, Pelosi said, include the hundreds of thousands of illegal aliens and border crossers who arrive at the southern border every year. Yeah, let that sink in for a moment. Now, anytime you hear a Democrat use the term “voter suppression,” know that is their new term to describe illegal aliens gaining the right to vote. Heck, the Democrats are already doing this in local governments. San Francisco started registering illegal immigrants in July, so they can vote in the November city school board election, reported Investor’s Business Daily. Never fear, Americans are catching on. “And this is the exact reason why she does not want a wall. They are her constituents. Not the people who actually have citizenship. Honestly, this is where law enforcement should make a stand and deport anyone who is a non-citizen and voting,” tweeted Joy Robbins-Naper. And this is the exact reason why she does not want a wall. They are her constituents. Not the people who actually have citizenship. Honestly, this is where law enforcement should make a stand and deport anyone who is a non-citizen and voting. I can hope hope American citizens see how devious Pelosi and Democrats are. They would drag a dead man to a polling location for a vote. Florida Brenda Snipes vote fixing techniques in every Blue state, guaranteed. Every possible method is in play. Drunken pill head wants to take advantage of these people simply because they don’t know any better. Little do they know this country will soon be just like the one they are running from if the left has its way. There are thousands of responses to Pelosi’s plan to give illegal aliens voting rights. And make no mistake, this is why the Democrats are all for getting rid of the Electoral College. They know the majority of illegals live in blue states like California, Washington, and New York. They need to make the popular vote the law of the land so they can easily elect a Democrat for president. This is their plan. As the election season heats up, we will see more and more pleas to get rid of the Electoral College and pleas to stop “voter suppression,” aka allow illegals to vote. We won’t be fooled. Let’s make sure everyone knows this is the game Pelosi and her Democratic rats are playing. This time they have gone too far, and American patriots won’t sit idly by. Sign up to be a poll watcher. Fight back. We won’t let America be destroyed from within. The content on expresses a personal opinion, advocates a point of view (e.g., on a social or political issue), or is self-promotional. For the purpose of fact-checking, it should be rated as Opinion according to Facebook policy.